404 page is kind of page type that will be shown where visitor landing on the wrong page URL. On some scenario, it will happen if we have deleted a post and visitor still got the link from somewhere. Sorry, the page you are looking for in this blog does not exist. This message called by <b:include data='top' name='status-message'/> under status-message inclusion. Some newer default blogger theme does not have this inclusion in XML editor since is managed or stored in the server, otherwise, we can include it manually under Blog1 widget. 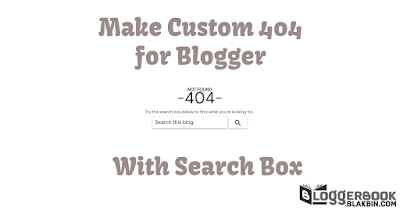 To activating custom error 404 page, we can choose between this two method. This is the simplest solution. On Error and redirects section under the Search preferences Setting tab, click on "edit" and simply copy and paste the HTML code above then save changes.